How do you stay grounded? What is it that helps you hold on to life’s anchor? How do you stay grounded? What is it that helps you hold on to life’s anchor? What is it that connects you, no matter what is going on, to the reality that God is there for you, loving you, drawing you, supporting you, blessing you? It is so easy to lose focus – lose our grounding. When things get tough – the kids get sick, people we love aren’t getting along, the month is longer than the money, people are grumpy and lashing out – you know, life! – when things get tough, it’s so easy to lose sight of the many, many blessings God has poured into our lives. It will surprise you what the Lord has done. What are the gifts in your life for which your are grateful to God? You will find markers in your pews and post-it notes in your bulletin today, and I encourage you for the rest of the service to use them to write Post-It Testimonies which we will offer to God in a few minutes during our offertory time. That’s what the tree trunks are for. 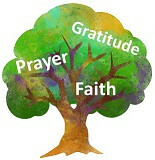 We are going to create two huge blessing trees, building on them each week through the end of October. Jeremiah 17:8 - They shall be like a tree planted by water, sending out its roots by the stream. It shall not fear when heat comes, and its leaves shall stay green; in the year of drought it is not anxious, and it does not cease to bear fruit. Trees have deep, deep roots. Gratitude is like those roots. It keeps us connected and nourished because like a root, gratitude taps into the Source. The choir is going to sing an anthem for us right now called All That I Am. William Himes, a Salvation Army musician, wrote this song when his young wife was dying with cancer. They had 2 small children. William Himes was tapped into the root of gratitude for the blessings of God. It is the only way he could have written: My all I give, Lord; for You I’ll live, Lord, Come what may.